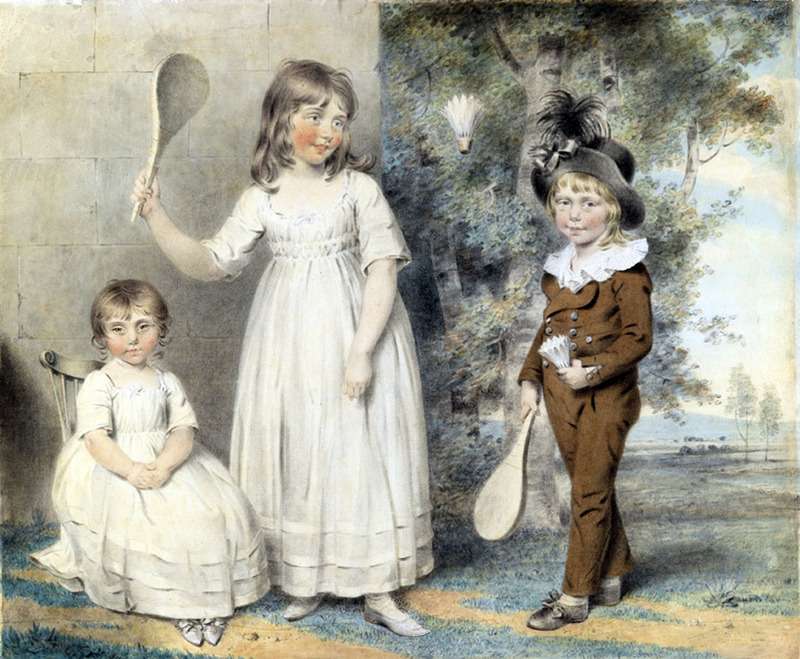 Miss Ellen, Miss Amelia and Master George Ray, the children of Frederick and Ellen Ray of Abingdon, Berkshire in a landscape, the elder children playing battledore and shuttlecock. Literature Dr. G.C. Williamson “John Downman RA: his Life and Works” (London, 1907) page LV, catalogue number 9. "....the prettiest and most elegant of portrait painters of his age in chalk and watercolours" (Sir Ellis Waterhouse). He was a pupil of Benjamin West PRA, and entered the Royal Academy Schools in 1769, and exhibited at the annual exhibitions for 49 years from 1770. He was the companion of Joseph Wright of Derby in Rome in 1773-4. The largest collection of his works is in Cambridge, (where there was a one-man exhibition in the FitzWilliam in the Autumn of 1996), though there examples of his work in many collections in the UK where he was widely peripatetic. From 1779 to 1804 he was centred in London, whence he travelled widely, eventually setting in Chester for the last seven years of his life. Although his work as a small-scale portraitist is widely known, his subject pieces are today rare, despite exhibiting more than two dozen at the Academy. They have, in all probability, suffered the same fate of many unsigned 18th century oil paintings, being erroneously attributed to other artists. There is an important collection of his drawings in the FitzWilliam Museum, Cambridge, where an exhibition of his works was exhibited in 1996. The present painting is amongst the largest and most accomplished of his group portraits.